"Count your blessings" - those coins you have put in the Blue Box in thanksgiving for large and small daily gifts from God that brighten your life and the lives around you. 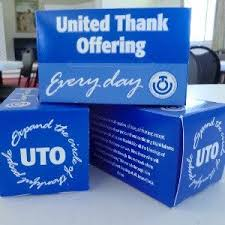 On Sunday, November 4th, United Thank Offering (UTO) envelopes will be available in Sunday bulletins, the Narthex, and the Guild Hall. Please enclose your cash or check for the amount of your blessings. Checks should be made payable to the Cathedral Church of St. Paul with UTO on the memo line. Please send or bring the envelope to church on Ingathering Sunday so that it can be joined with the thank offerings of other Episcopalians. The United Thank Offering Memorial and Gift Trust Fund was established as a permanent trust. Gifts enable ongoing prayer and remembrance. The names of those honored or memorialized are permanently recorded in a book that is kept in the UTO office at the Episcopal Church Center. The book is displayed at each Triennial Meeting of the Women of the Church. Gifts to the United Thank Offering Memorial and Gift Trust Fund may be made at any time. A special tribute of thanksgiving is appropriate in loving recognition fo devoted leadership, ministry and faithful service. Special events as birthdays, anniversaries, graduations may be recognized. Gifts also may be made in loving memory of a cherished friend, relative, or church leader. Brochures with attached mailing envelopes will be available with the UTO Ingathering envelopes, and your gift is tax-deductible.